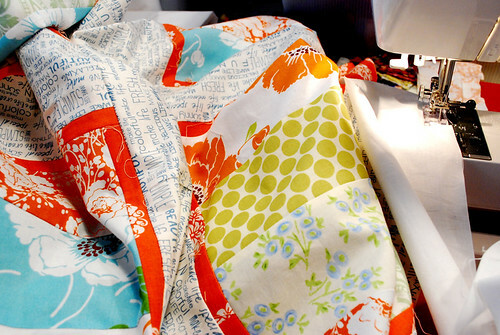 Moving into summer - Stop staring and start sewing! Well we don't have a summer schedule yet. Unless sleep in, eat, read, lay around, repeat, counts as a schedule. The tv's been broken for a few months but nobody seems to be missing it and I usually see the kids with a book in their hands most days so I guess I'm happy with the current schedule then. I'm trying to finish up the second Harry Potter book but I don't think I'll get them all done before the last movie comes out next month. 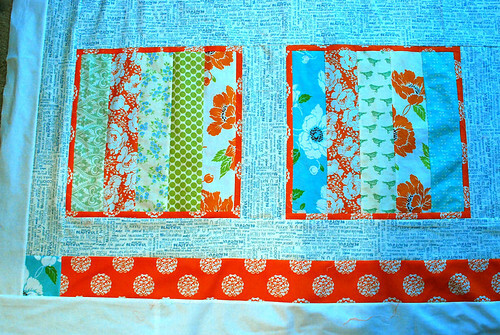 I'm finally digging in and finishing Sofia's quilt up. The finished blocks have been decorating my wall for months but it was time to take them down and get this done since it's really holding up the re-decorating of her whole room. It's very busy looking to me but Sofia is liking it so I'm happy with that. 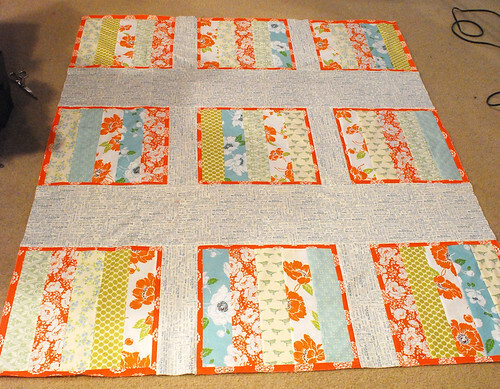 I got everything together and realized I was short on the Sweetwater fabric I'm using for sashing. At that point my plans sort of flew out the window and I started fudging it. 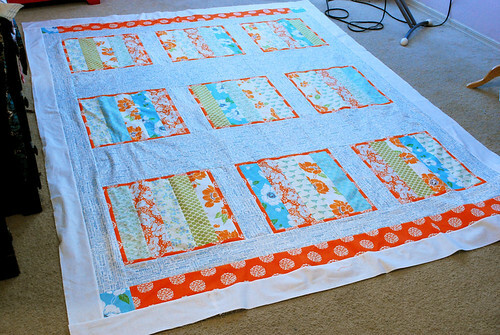 But that's the beauty of these kinds of quilts I guess, you just make it work. This is my biggest quilt so far (twin sized) and it just kept getting bigger and heavier with each strip of fabric (they do that!) so I'm going to need to set up my tables a little differently in the future. Here is the finished top with a narrower inner border than I had planned but at least there was enough to go all the way around. I added the orange strips to get the right length and make it a little more interesting. I'm not sure I succeeded in the interesting part (at least not in a great way) but I'm not too disappointed with it. Here's a close up just after I finished it. I now have it all basted (using the adhesive spray and some basting pins) and sandwiched together. I'm trying a sheet from IKEA for the backing and my fingers are crossed that it turns out to be a good decision. I can tell already that it's heavier than regular cotton fabric which is not really great in Arizona (the lighter the better) but I'll know soon enough. I'm looking forward to the quilting and binding part. I think I'll put in the long version of Pride and Prejudice (the computers are working at least!) and stitch my little heart out.